Besides the Guide to Print Workshops, our newly designed and expanded Internet site provides artists with practical guidance on proper documentation for print editions, registering their copyright, taking and labeling slides, writing useful resumés and publicity materials, contacting museums and galleries, etc. We offer a list of Competitive Print Exhibitions to make it easier for artists to learn about and enter exhibitions, thereby encouraging them to make their work more widely seen, and we have compiled a list of contemporary print collections at museums, universities and libraries that are open to artists and the public for study. We have also provided information to the U.S. Copyright Office, including testimony at Congressional hearings, about printmakers' copyright concerns and VARA (Visual Artists Rights Act) issues. A recent project (the direct result of input from individual artists and council representatives) is the addition of technical articles to our Internet site. 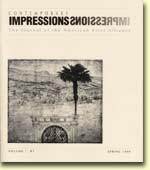 Artists want information about new techniques, processes and materials with an emphasis on safer printmaking, while not taking space away from the current content of Contemporary Impressions nor paying the costs of printing another publication. We are currently seeking advertisers to defray the costs of expanding this area.